Malaysia produced the first upset in the WSF Men’s World Team Squash Championship by beating Asian rivals India, the eighth seeds, 2/1 in the second qualifying round of the biennial World Squash Federation event at Modern Squash in Marseille. Playing in team order 1, 3 & 2, world No.21 Saurav Ghosal opened proceedings for India by taking on Nafiizwan Adnan, a lower-ranked Malaysian to whom he had never before lost. The Malaysian number one took the opening game before Ghosal fought back to forge a 2/1 lead. Adnan, the 31-year-old UK-based world No.31, drew level to force a decider – but twice again Ghosal led, 8-6 & 9-7. Underdog Adnan persevered however and, after 72 minutes, clinched the 11-8, 8-11, 5-11, 11-4, 11-9 victory which swung the momentum in favour of the ninth seeds. India struck back when Mahesh Mangaonkar recovered from a game down to beat 21-year-old Mohd Syafiq Kamal 8-11, 11-8, 11-5, 11-5 to level the tie. Teenager Eain Yow Ng, who, like Kamal, was making his maiden appearance in the championship, then faced India’s experienced Harinder Pal Singh Sandhu, a 28-year-old from Chennai celebrating his fourth time in the world championship. 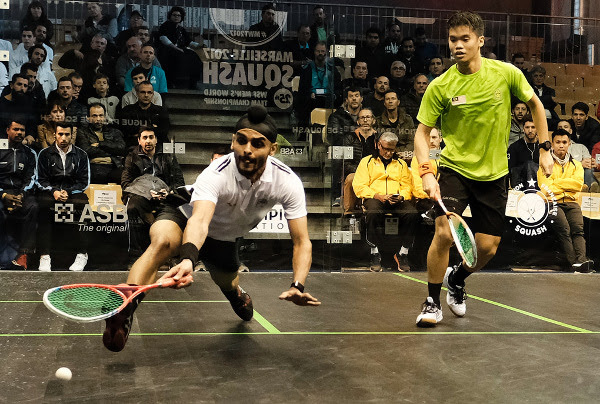 It was the pair’s first meeting, but 19-year-old Ng (pictured above, right, with Sandhu) was unfazed – and battled back from 2/1 down to overcome Sandhu 11-7, 5-11, 8-11, 11-6, 11-5 in 62 minutes to strengthen Malaysia’s bid to top Pool H.
Malaysia’s team manager Major Maniam, who only a year ago returned to his home country after a lengthy period as the Indian National Coach, was delighted with his team’s performance: “With our No.2 out with an injury, we arrived in Marseille with a slightly weakened team – but Wan (Nafiizwan) and Yow were outstanding today. “Wan was absolutely focussed and faced an experienced opponent in Saurav. “And with Yow, what can I say! He played another very experienced player and truly lived up to our expectations. We were expecting a good hard fight. Hari just didn’t have an answer in the fifth. India’s national coach Cyrus Poncha had a different view: “I’m disappointed with the result, for sure – we should have won. With Saurav 8/6 up in the fifth and Hari 2/1 up, they both let it go. “It’s going to make it more difficult to stay in the top eight. Sixth seeds New Zealand were also taken the full distance before seeing off USA, the 11th seeds, 2/1 to ensure top place in Pool F. ‘Superman’ Paul Coll, the current world No.9, put the Kiwis ahead after beating US top string Todd Harrity 11-9, 11-7, 11-3 – but Chris Hanson forced a decider when he defeated NZ’s Evan Williams in four games. It took Campbell Grayson 58 minutes to finally get the better of US No.2 Christopher Gordon (pictured, right, above with Grayson), winning 11-6, 11-3, 9-11, 11-7, much to the relief of his NZ team-mates. “It’s the world team championship so the seeding doesn’t mean much,” explained NZ team manager Kashif Shuja. “They have some great players and we knew it was going to be tough – and it was. Chris Gordon’s sportsmanship really impressed me – that was a great match. “It’s good to be in the last 16, but we are just going to take each day as it comes. It’s a rest day tomorrow so we are going to relax and hopefully come back fresh. US team manager Paul Assaiante added: “I thought we played well. Coll just puts so much pressure on his opponents, not just physically but mentally too. Hanson did a really good job to bring us back into the tie. “You could see that Grayson was labouring in the fourth against Gordon, but all of a sudden he got back into the game. The longest battle of the day took over four hours to resolve when 4th seeds Australia ultimately prevailed 3/0 over 13th seeds Wales. 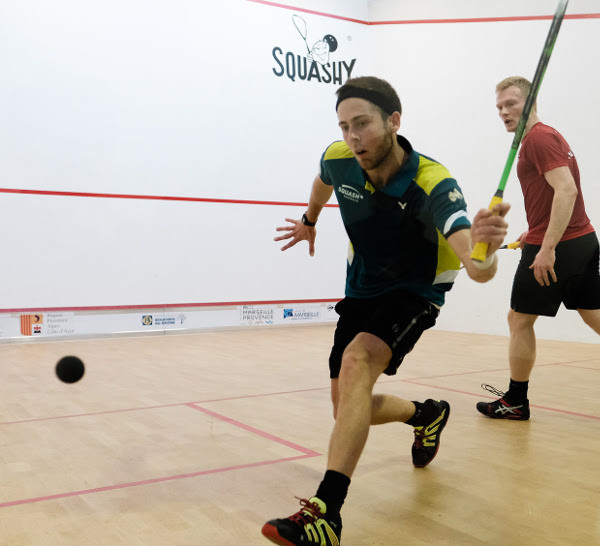 Left-hander Ryan Cuskelly, competing as the Australian No.1 for the first time, survived an 85-minute five-game encounter against fast-rising Welshman Joel Makin (both pictured below), winning 11-9, 9-11, 11-5, 4-11, 11-7, before Victorian Rex Hedrick sealed victory for record eight-time champions Australia with a 12-10, 11-8, 11-1 victory over event newcomer Emyr Evans in 54 minutes. 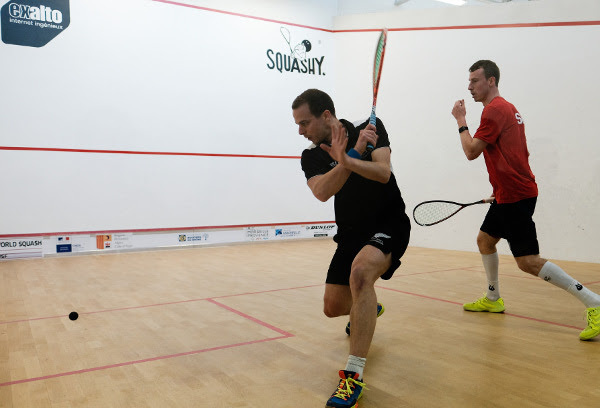 The third rubber also went the full distance before hard-hitting Aussie Cameron Pilley claimed his 10-12, 11-9, 11-7, 5-11, 11-5 victory in 68 minutes over 30-year-old Welshman Peter Creed. “We knew Wales would be tricky to get past,” said Paul Price, the Australian national coach and a former world No.4. “If Joel had won the match with Ryan, that could have changed everything. 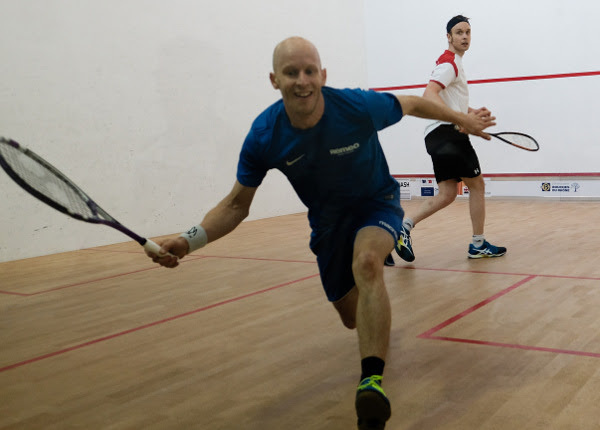 Germany eased into the last 16 with a second successive victory in Pool G – but this time the No.7 seeds dropped a match as opponents Scotland, the 10th seeds, claimed some consolation after going 2/0 down when second string Scot Greg Lobban beat Raphael Kandra in five games. German coach Oliver Pettke said: “I’m happy with the win – and it’s definitely positive for the team spirit for the rest of the week. It’s always close with Scotland – and it’s more difficult than the European Championships where there are four players in the team. Ramy Ashour made his first appearance in the 2017 championship when he helped favourites Egypt to a 3/0 win over Switzerland, the 16th seeds. Appearing in his fourth championships now as a 30-year-old – following a distinguished career in which he regularly achieved successes as one of the game’s youngest players – Ashour beat the tournament’s youngest player Roman Allinckx, a 19-year-old, 11-2, 11-5, 11-5 to extend his all-time unbeaten record in the championship to 15 matches since 2009. “It’s unusual for me to be the oldest player in the team and the fact that I’ve played in the event before makes it a little bit more comfortable as I know what to expect,” said the former world No.1 and three-time world champion. When it was pointed out that his opponent was the event’s youngest participant, Captain Ashour said: “He was the youngest? I have been in that position before! Finland‘s record 17-time national champion Olli Tuominen also reached a notable milestone in Marseille when, in his ninth appearance in the championships since 1999, he played his 50th match. The former world No.13 went down 11-9, 11-7, 11-8 to long-time European rival James Willstrop as defending champions England eased into the last 16 with their second 3/0 win in two days. “Finnish people aren’t naturally proud, but it feels good to have played my 50th match in this event,” said the 38-year-old (pictured above with Willstrop). “The fact that I have been able to play at this level for this long is great. “Even though I lost today, it means a lot to me that I can still handle these guys – and I am still enjoying it!